There was a meaning behind the word ‘ABCD’, A is cover for Artificial Intelligence, B for Big Data, C for cryptocurrency and D for data. Blockchain Academy Asia is a global research and development and educational institution established in 2018. 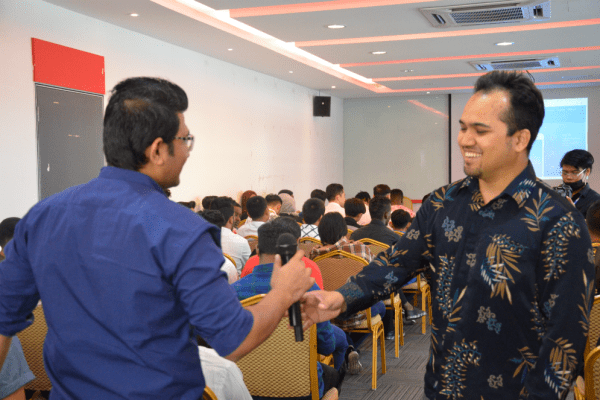 Our objective for this seminar is to educate not only for Computer Science student in Geomatika University College but the other programs also can have the interested in cryptocurrencies, employees of banks and other financial institutions, professsionals of fintech sector on all aspects of cryptocurrencies and blockchains. Cyrptocurrencies and blockchain technology are already being used by NASDAQ, Swiss Railway SBB, some Airlines, large banks, IBM, energy companies, and hundreds of now small companies that may displace big established companies that fail to exploit this revolutionary technology. Academic-industry partnerships are becoming increasingly robust as a result of growing economic volatility, competition from emerging economies and a rapidly evolving technology. In a nutshell, academic collaboration is beneficial to corporate in learning new blockchain technology, and to students for Geomatika University College increasing the breadth of knowledge and learning to solving a problem in practical. Next PostFORUM: 15 Years GUC - What's Next?